James Joseph Ryan was born May 18, 1957 in Bellmawr, where his father served briefly as mayor. Smart and solidly built, Jim was a good all-around athlete who gravitated to football. He played linebacker for Bishop Eustace Prep in Pennsuaken Township and led the Crusaders to a state sectional championship in 1974. The school was best known for its basketball program. It produced Villanova star John Olive and the Melchionni brothers, Bill and Gary. Jim was no slouch on the hardwood; he regularly pulled down double-digit rebounds. He also lettered for the baseball team. Jim attended William & Mary on a football scholarship. He and Jeff Hosmer led the Indians’ defense. In 1976, as a sophomore, Jim had 139 tackles, which still ranks among the school’s Top 10 defensive seasons. During Jim’s senior season, the school changed the team’s name to the more culturally sensitive Tribe. The 1979 NFL Draft came and went without Jim hearing his named called. He was invited to camp by the Denver Broncos and made the club along with another undrafted player, Steve Watson. Both would contribute to Denver’s 1986 and 1987 AFC championship squads. Jim was a substitute and special teams standout for three seasons before ascending to the starting lineup during the 1982 strike season. 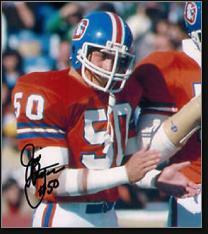 He was a starter at left outside linebacker for the remainder of his pro career, and played with some of the NFL’s most dynamic linebackers, including Randy Gradishar, Tom Jackson, Rick Dennison, Karl Mecklenberg and Bob Swenson. All, including Jim, are typically ranked among the team’s Top 10 all-time linebackers. Jim played a key role in the 1986 AFC Championship, intercepting a Bernie Kosar pass in the 23–20 overtime victory over the Browns. In 1987, Jim picked off three passes during the regular season as the Broncos won the AFC title again. He started in both Super Bowls, both of which the Broncos lost. The contest against the Giants was close, but the loss to Washington was a 42–10 blowout. Jim came within inches of making a game-changing play when he blitzed Doug Williams in the second quarter. He nailed the Redskins quarterback as he released the ball, but his pass went for Washington’s second touchdown. Jim retired after the 1988 season, his 10th year in the league. He remained in the Denver area after his playing days, and worked for the Broncos as president of their youth outreach foundation. He also dabbled in announcing. In 2002, Jim took a job as head coach of Regis Jesuit High School in Aurora, Colorado. He had previously been a volunteer coach with the team. In 2005, Jim joined the Broncos coaching staff under Mike Shanahan as a defensive assistant. Two years later he was promoted to linebackers coach. In 2011, Jim joined the Houston Texans’ coaching staff as an offensive assistant, working primarily with the linemen. The team showed instant improvement in time of possession and rushing yardage. Prior to that he had been a defensive coach in the short-lived United Football League. In 2013, Jim was inducted into the Camden County Sports Hall of Fame. In 2015, he returned to Bishop Eustace to present a golden ball to the seniors on the football team.